Here’s some figures to make you queasy after all that rich Christmas dinner. As was reported recently, Australia’s bold new short-term greenhouse gas reduction target is to reduce carbon emissions by 4% on year 1990 levels by 2020. What does that mean in real terms? Well, according to the National Greenhouse Gas Inventory, our total emissions in that reference year were 552.6 Mt (million tonnes) of carbon dioxide equivalents (CO2-e), with 286.4 Mt of that coming from energy generation. In 2006 (the latest inventory year), it was 576.0 Mt, with a whopping 400.9 Mt of that now coming from energy. So, our world-leading aim is to ‘only’ be emitting 530.5 Mt CO2-e by 2020 — a saving of 22 Mt on 1990 levels. Forgive me if I’m less than impressed. But in reality, it’s far, far worse than that — actually, ridiculously so. 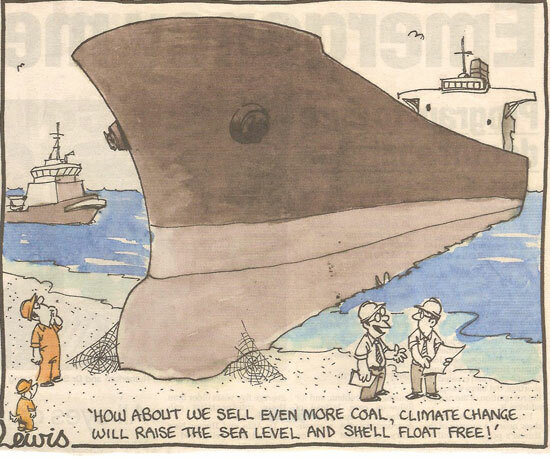 The reporter then blandly notes that this investment will more than double the export capacity at Newcastle (New South Wales) from 97 to 200 million tonnes of coal a year. Hmmmm. Let’s see — that’s an extra 103 Mt of coal being shipped out each year. Now, when you burn a tonne of coal, you yield about 3.6 tonnes of CO2 (since the carbon atom combines with 2 x oxygen atoms). So that’s $580 million of taxpayers money being channeled into a handout to the fossil fuel industry that will result in an additional 371 Mt CO2-e being pumped into the global atmosphere each year. But wait, there’s more! Actually, this was from earlier in the year, but the wound still smarts when you rub salt into it. In April 2008, ‘Environment’ Minister Peter Garrett gave the green light for a multi-billion dollar three-phase plan to expand the Wiggins Island Coal Terminal in Gladstone (Queensland), such that it will be able to export an additional 84 Mt of coal per year — a decision applauded by the Queensland State Government. Okay, so that’s another 302 Mt CO2-e released by someone, somewhere, up into the great aerial ocean. But hey, again, it’s for export, so it’s just not our problem. All 371 + 302 = 673 Mt CO2-e of it. It doesn’t matter that these two infrastructure projects, announced in 2008, will result in emissions 17% greater than Australia’s TOTAL CO2-e annual emissions, and cancel out our 4% reduction by 2020 commitment more than 30 times over. Nah, no sweat. 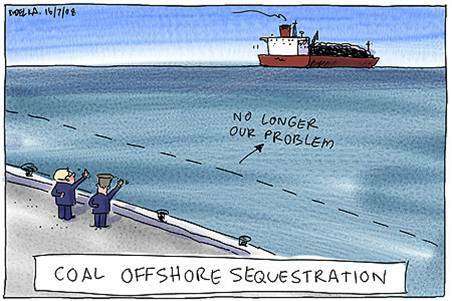 It’s all covered by offshore sequestration. Reduce 22 Mt here, add 673 Mt there. Yet Mr Rudd says this trade-off “…gets the balance right“. Keep going, Barry. Very best wishes for 2009. Now, you are forbidden to slow down economic growth, but we also know, that our planet and the sources are not endless. Oh, wait! Of course, in economic terms, resources *ARE* endless and before they run out, we switch to another source – we did in the past, we will in the future. That is, BTW, the main reason why most of economists do not see peak-oil as a prbolem. More to that, some people think that this planet could possibly sustain up to 50 000 000 000 happy people. In their point of view, constraining CO2 emission (and/or growth) equals to eco-facism… now what? Ideas? I suspect that if you suggested to someone in government that we should reduce coal exports, they will tell you with a perfectly straight face that if we reduced coal exports, that will just mean that “an equivalent amount of coal will be mined elsewhere”. There are two problems with that argument. One is that it oversimplifies the way that price works (it assumes that the price-elasticity of demand for coal is totally inelastic, or the price-elasticity of supply of coal is totally elastic. The other problem is that it is basically arguing that we should be free-riders in a prisoners dilemma. Based on the best current interpretations of the science (denialist phantasy-physics aside), and considering the current global political trajectory, I think that the planet’s current ecosystems’ integrity was essentially screwed about three or four years ago. Otherwise the biosphere is simply going to barf up the pain in its belly in the only way that it knows how. posted 27 December 2008 at 10:24 PM by Bernard J.
coal as quickly as we can before we get forced to leave it in the ground. The problem here is that Australia has not adopted a standard for reporting its indirect emissions. Our Government likes to think that if it doesn’t need to report some emissions under the Kyoto reporting guidelines, then they just don’t exist for Australia. If we are to have integrity when tackling climate change, there is an ethical place to acknowledge indirect upstream and downstream emissions (that fit into the Scope 3 category as we do not import electricity from other countries), as well as our direct emissions released from the Australian Continent, associated islands, territorial waters and Antarctic operations. It is not hard to recognise that Australia’s coal and gas exports cause emissions of the same magnitude as Australia’s acknowledged emissions. To completely ignore this impact is a bit like saying that one is not responsible for killing endangered animals; it is the customer fault for buying ivory and Rhino horns. Of course we bear responsibility for our part in the economic and other harm that this contribution to climate change is causing. Managing scope 3 emissions requires working with our customers to switch to lower greenhouse intensive solutions and where Australia’s coal is burnt for electricity this should be a very high priority as there are alternative lower greenhouse energy sources available. Our greenhouse reporting should also acknowledge the emissions caused ‘within’ forestry operations that are not reported under Australia’s Kyoto requirements and additional emissions that are or may result from climate feedback loops such as the overall drying and thinning of Australia’s forest remnants, and potential changes in ocean sequestration in Australian waters. For the Australian Government to demonstrate its commitment to tackling climate change, it should report the Australian emissions picture in full as different from its Kyoto requirements, so that we don’t just keep hearing the half truth’s such as “Australia accounted for less than 1.5 per cent of global emissions” (John Howard 2007). Yet another frustration-inducing post. Politics trumping policy again. On the topic of politics over policy, are you able to shed some light on what the ‘lobbying’ process would have been between the Fed Govt and the carbon intensive industries prior to the release of the CPRS white paper? The majority of articles focused upon the impact of the lobbying upon the efficacy of our CPRS. I am yet to read about EXACTLY WHAT the lobbying process would have been. Are you able to shed some light on this? In your opinion, how would any negotiations between the govt and industry lobbyists have proceeded? What would the carbon-intensive industries actually have bought to the table in any ETS-related negotiations? Surely they must have more than the old chestnut of the ‘off-shore job leakage’ threat. I understand you may not have knowledge of the political process Barry, so if anyone else out there does, their explanation would be greatly appreciated!! Many years ago, I was part of the local Friends of the Earth group in Elmbridge, Surrey, asking people in our local shopping centre whether they were concerned about global warming. Most of the responses were unmemorable. But one response was memorable, it was: “No, it’s all right, I don’t live here!” He was disguised like a normal human, but presumably he was an extraterrestrial. that agriculture wouldn’t be in the ETS when it started. A big chunk of the Australian public may be content to be fooled into believing our contribution to global emissions is small and policies are in place to make them smaller, but the rest of the world knows Australia is a major source of coal and will notice that the world’s no.1 exporter of coal is building the infrastructure to export more. I don’t see any real signs that the Rudd gov’t truly appreciates the seriousness of climate change or will put the longer term need to get serious ahead of short term expediency. I tend towards despair that we’ll see any appropriate policy from mainstream politics. I fervently hope that we’ll see peel and stick PV that’s as cheap as chip wrapper soon enough to make renewables the low cost, easy, “sensible” choice. It would be nice to think that there’d be enticements and incentives (such as car makers get) to make them here, but honestly I don’t care if they are made in the US or India or China or Spain as long as they get massively mass produced. Paul @7: Meeting with officials, MPs and relevant ministers, lunches, briefing papers, in-house economic impact analyses, ‘alternative’ business plans, donations — the whole gamut. Mostly just having lobbyists there, constantly selling ‘the message’. But I’m not a political animal and so don’t know the detailed methods — only what I’ve occasionally observed first hand. Geoff @9 is also right about a lot of Hansaard passing through to the keeper because no one is sufficiently across the material to challenge right from wrong (or misleading). Ken @11: Agreed, I see no signs either. Terribly disappointing, but not unexpected. So it appears they are off the hook. It’s not the use of coal that’s the problem, but how coal is used! It’s not cigarettes that are the problem, it’s the way people smoke them. What do they imagine their customers in thirty-five countries around the world are going to do with it? Like Pigou’s solution, Australia as a proud 30 percent export participant in the global problem should at the very least accept 30 percent of the blame. The Australian Coal Industry has obviously done some figuring to project their commercial interests to 2020 for a 50 percent increase in global consumption. If their assumptions are correct, and I think we can trust these guys, then on present exports, by 2020 we will have exported over 3 billion additional tonnes. And how do we get our gross domestic product of coal exports of around $2 billion a month out of the country and off on their adventure back to the atmosphere? Australia proclaims presently (in 2008) to only be the contributor to 1.46 percent of global carbon emissions. Doesn’t the fact that we export the fossilized carbon that creates massive amounts of environmental damage get to figure in our responsibility for global pollution? I think I would have Pigou’s vote to include it as part of the Australian national footprint. Digging deeper, as they also must to keep up with exports, we find the plot thickens. Nice article, for me coal production is the number one climate change concern in Australia. There are also many other significant infrastructure expansions taking place, the Queensland Government has budgeted $5.4 bn for coal infrastructure and plans to increase exports by several hundred tonnes by 2030. Summary information that is only a little out of date is available on a slideshow here. More up to date information will be up soon. If you are interested in being part of a growing campaign against this expansion, or supporting the many communities and farmers opposing new mines, please get in touch. The failure to regulate (or often even acknowledge) emissions from Australia’s coal exports is one of the greatest failures of Australia’s response to climate change at present. However, the international system sets the stage for this approach as the Kyoto Protocol attributes liability only for direct national emissions (although even these can be offset with emission reductions in developing countries under the Clean Development Mechanism). Thanks Brad – yep, you are right that coal of different ‘quality’ yields different CO2 amounts on combustion – my figures were rough, but still in the right ballpark. Of course given that I didn’t include in that calculation all the particulate uranium, thorium, mercury and lead that also goes up in the coal smokestack via combustion, and carted out in the voluminous post-combustion coal ash residue, nor all the methane vented from coal beds and open cast mines, I reckon it fairly well balances out! BTW, when you say: plans to increase exports by several hundred tonnes by 2030 – I assume you mean ‘several hundred million tonnes’? Opposing ANY new coal fired power stations or mining developments is a clear and present priority, given our current inability to capture the emissions and sequester them. So yes, I’ll certainly support such actions. Thanks for your reply. You’re right, I did mean several hundred million tonnes.